Hindu symbolism enlivens moody Northwest landscapes in a new show by Seattle artist Catherine Eaton Skinner. In Seattle artist Catherine Eaton Skinner’s landscapes, sometimes the bindu makes all the difference. A bindu is the dot, not always red, seen in Hindu art and sometimes on people’s foreheads. It is, in Skinner’s words, “a focal point amid the chaos.” Skinner’s work also features the trikona (a triangle symbolizing “intense spiritual aspiration”) and tiny red houses, seen either in solid silhouette or rudimentary outline. Both triangles and houses jump out of these images like small, sharp beacons. The landscapes themselves, however, are pure Pacific Northwest in sensibility. 11 a.m.-6 p.m. Mondays-Saturdays through Feb. 27, Abmeyer + Wood Fine Art, 1210 Second Ave., Seattle (206-628-9501 or abmeyerwood.com). In her artist’s statement, Skinner says her aim in “Teelun: A Gentle Wind,” is to revive the “memory of what landscape was and can be.” With their green-brown-golden organic flow and sometimes startling vantage points, she makes a good case for the genre. She also subtly disguises how many elements are at play in these spiritual road trips. Skinner has written that she uses the “Eastern-philosophical number of 108” and “repetition of sacred forms,” including the five elements of “earth, fire, water, air and space” in her work. That explanation may be a bit vague, but it’s hard to argue with Skinner’s technically sophisticated and visually seductive results. For instance, two series — “Passages” and “Traces” — aren’t the neoimpressionist paintings they initially appear to be. Instead, they’re photographs printed on rag paper, mounted on panels and then embellished with encaustic and oil paints. Their palimpsest energy makes them compelling — and when Skinner isn’t lending them accents in red, she’s imaginatively disfiguring them with yellow traffic-lane stripes and other roadside phenomena. Most of the pieces are modest in scale. But several large works dominate the show. 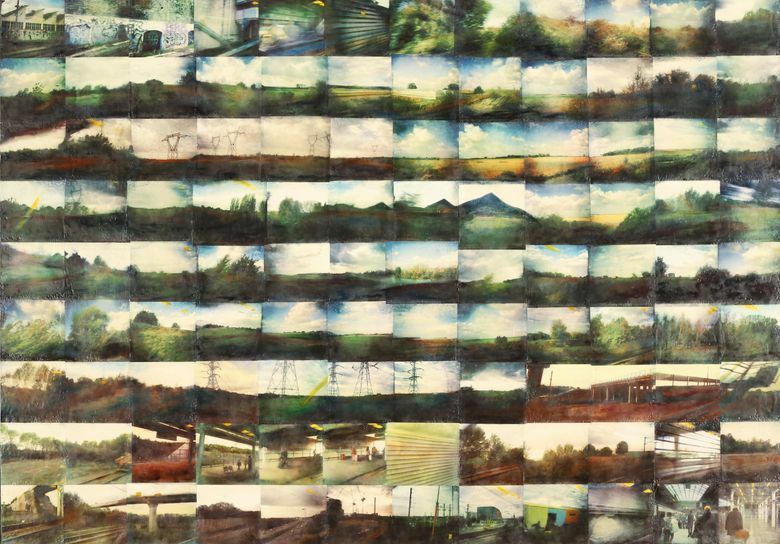 “Passages XII” compiles 108 images of a train trip from Paris to London, with urban sights (graffiti, railway platforms, pylons) alternating with rolling fields and copses. The feathery smears of paint over the orderly photo collage give the whole piece a blurry, unifying velocity. At the other end of the gallery, “Teelun 1” is a diptych of poplar trees seen from a low angle, with a floating red triangle imposed on the panel at the right. 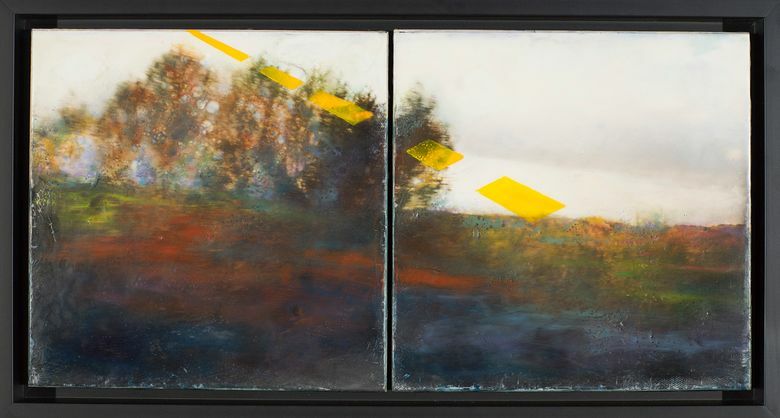 “Teelun 1” skips the photographic component, and while it has a seamless sweep, it’s actually made of 108 encaustics and oils on paper, assembled on two 72-by-48-inch panels. A few pieces in the show are simply paintings, pure and simple. “Pale Green Light Rising From the River” is exactly what it says: a gorgeous triptych of a gauzy, riverine scene that beguiles the eye with its hazy serenity. 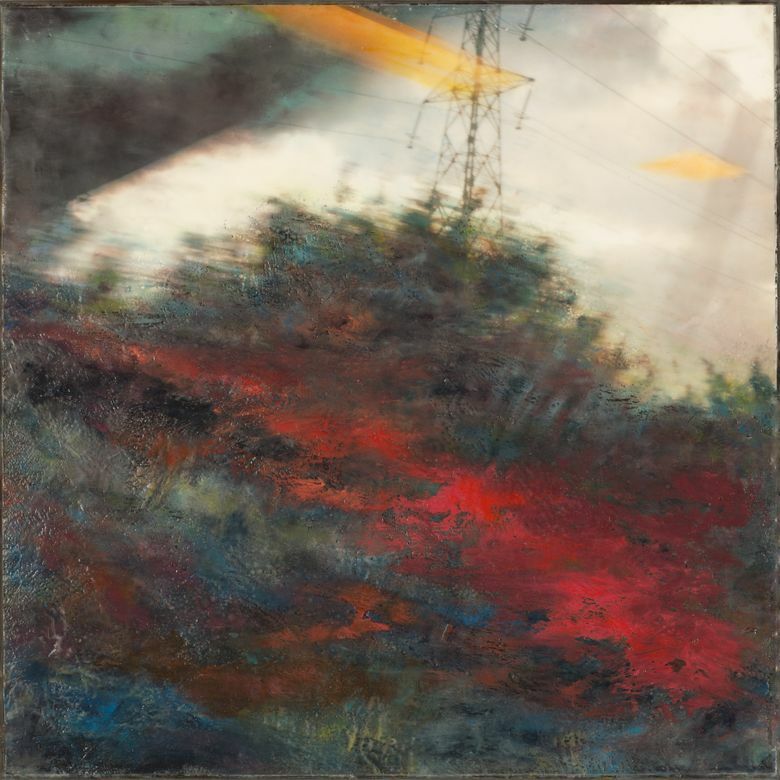 “Zhen I” and “Zhen II,” two oils-and-encaustics on linen panels, portray rugged mountain scenes suffused with red streaks that lend them an almost abstract-expressionist flair. Two sculptural/bas-relief pieces, “Mka Dan Sa V” and “Kibo XI,” feel like oddballs in this show. It’s hard to connect them with Skinner the painter — but the overall impact of “Teelun” is both meditative and stirring. 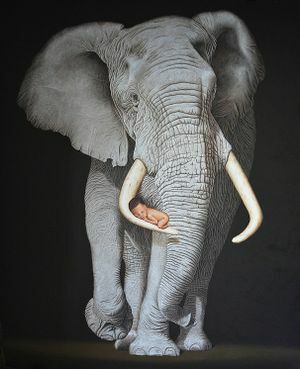 “Sentinel,” a fastidiously rendered oil-on-canvas, enjoys pride of place with its looming image of an elephant balancing a sleeping human infant on one of its tusks. Reportedly two years in the making, its hyperreal details — wrinkled trunk, veiny ears, projecting tusks — pop out with a 3D effect. “Turning Point” runs 11 a.m.-5 p.m. Mondays-Saturdays through Feb. 29.